Hi friends. This is a super tough week for me. 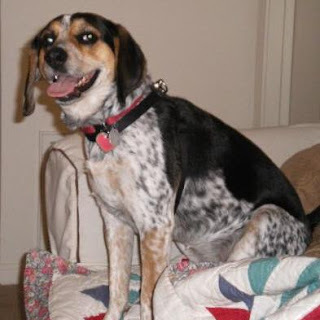 We lost our sweet 16 year old beagle, Abby, after an illness that had lasted a few months. I feel like she took a piece of my heart with her. Here's a picture of her in her prime. She was probably around 4 years old in this picture. 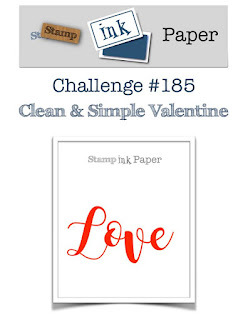 Luckily this week's Stamp, Ink, Paper Design Team project was a CAS Valentine's card so it came together really quick without too much stress. I started out with one of the awesome Concord & 9th Dip- Dyed Cards and Envelopes. They have such a cool watercolor wash of color on them and make card making so easy! So I took this challenge so literally.... Clean and Simple. I stamped the Lil' Inker Designs Filled Heart directly onto the card base with Versafine Black Onyx Ink. 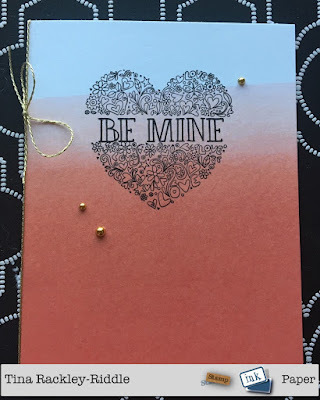 I then stamped my "Be Mine" sentiment in the center of that with the same ink. I added a piece of Gold Twine along the fold and then added three gold metallic dots to finish it off. Can you believe how simple this one was?